Liam’s death for the next few weeks consumed my soul, I was so angry, I wanted revenge, I wanted someone to say sorry, I wanted to know where exactly in his birth things had broken down, I wanted to understand why he wasn’t here today, like I said in a previous post I was a very angry person, my anger consumed nearly all my thoughts, I had been angry for around 6 weeks already and except for small reprieves here and there my anger lasted about another 6 weeks, but around this time it was at its height. On my days “off” when Alethea went to day care I would spend my time calling or emailing different NUMs (nursing unit managers) of different delivery suites at maternity hospitals around NSW. Maybe it was because I could talk a little medical to them, maybe they were just lovely ladies, or maybe it was the story that I told them, but each one gave me their time, talked to me with empathy and shared with me their hospital’s policy on emergency Cat 1 or code critical C sections, whether their hospital had theatres on site 24/7 and given the information that I provided to them, what they would have done if I had attended their hospital, now I totally admit that I couldn’t give them all the finer details of the CTG trace, (I didn’t have it in front of me, and some of the questions that they asked I couldn’t answer) and I was also probably biased in my opinion of what happened, however I did try to be very factual in what I said to them, because I wanted to get the most accurate answers to my questions, and to obtain that I had to try only to give the facts on what happened and not my opinion. Some of the NUMs asked me why my nurse hadn’t called a code critical at 12:30am and got things going from there, they said to me that the nurse had obviously called the OB into the hospital because she knew that there was a problem, she knew that I was going to need a C section and therefore she should have been able to call the code and get things started even before the OB had arrived, and therefore Liam could have been born by 1am (remembering that I was first connected to the CTG monitor at 12:20am, the nurse knew there was a problem from the very first contraction and Liam wasn’t born until 2:44am) I said to the first NUM who asked this question that I was unaware that a nurse could call a code critical or a Cat 1 C section, and her response went along the lines of “This is our job, we are experts in the field of delivering a baby, we can recognise when a baby is in distress and needs to be out straight away and needs the attendance of an OB, if we weren’t why would we be doing this job, to say that we can’t call a Cat 1 C section is to say that we don’t really know what we are doing and takes away some of our responsibility as midwives. My midwives will call a code as soon as they recognise the need for it, and from the time of calling the code to the time that the baby is out ranges from 7-20minutes” I asked her why she thought that my midwife didn’t call the code, and she responded with “I can’t say for sure, maybe her hospital doesn’t allow in their policy for the nurse to call it” I called and emailed lots of hospitals, and what I found was this…..and this is not meant to scare any mums who are pregnant, because most deliveries result in a healthy baby, I was the exception, I was that delivery that needed to be taken very serious and Liam needed to be out asap to have given him any chance at living. From what I found the big tertiary public hospitals have theatres on staff 24/7 and all of them have a policy where Cat 1 or Code Critical babies are to be born within 30minutes, some of these hospitals have refined this policy to say within 20minutes, and some of the big hospitals stats show that their code critical births happen as quick as 7mins but no longer than 20mins but do not have a formal policy on this. For the smaller public hospitals generally they didn’t have 24/7 theatre coverage, most of the time the theatres close between 9-10pm but they had to have staff on call that lived within a certain time frame from the hospital and theatres needed to be up and running within 20-30mins. For the private hospitals, most of them didn’t really want to share their policies with me (I’m not sure why) the ones that did told me that they didn’t have 24/7 theatre staffed but that they had policies in place similar to the smaller public hospitals, and their Cat 1 C section policy stated that the baby should be out within 30mins. From my investigations there were a few things for me to then think about. Why hadn’t my nurse called the code, why wasn’t Liam born by 1am, most hospitals policies on Cat 1 C sections stated that the baby needed to be born within 30mins of calling the code/category…but likewise some of the hospitals did not staff theatres 24/7 and when they didn’t their policy for theatre readiness was within 30mins, if a hospital took 30mins to get their theatres running then there was no way that a Cat 1 baby could be born within their stated guideline of 30mins, it could be close, but not within 30mins maybe 35-40mins is attainable but sometimes the 30min mark would not be reached. What people may not realise is that in these babies that are in serious distress every minute counts, every minute increases the risk of hypoxia, ischaemia and asphyxia, and indeed there are many studies overseas that state that the current 30minute protocol needs to be revised and changed to a maximum of 20minutes and that in certain cases this needs to be reduced to even 5minutes, but on average hospitals that are able to achieve a delivery time of less than 15minutes increase the babies survival, and increase their APGAR scores. If it is possible to achieve this already in some of the bigger teaching public hospitals, the same care should be given to ladies who attend smaller public hospitals and definitely in private hospitals where the lady and her private health insurance pay for the ‘privilege’ of attending! Like I said my mind was consumed with anger and finding a reason to Liam’s death, it was not in a healthy state of mind. I was very lucky that I had Alethea and Ryan to distract me, when they were with me I was not able to be consumed by my anger, I had to be a mummy, I had to be a wife, I had to be ‘normal’ it would not have been fair on them if they felt my anger, so I needed to put it aside when they were around, however as you can see from my frame of mind at this time it was very, very hard, so I decided that I needed to escape, to get away from everything and focus on the now. Here comes a part of our journey that I have not mentioned any of so far. 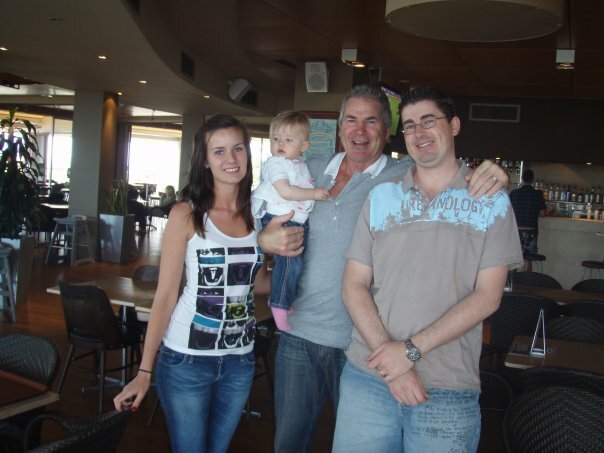 When Alethea was 8 months old, we had gotten in touch with Ryan’s biological Dad Peter, whom Ryan had never met before. One of the first comments that Peter said to us on the phone was “I have waited 31years for this day” ie the day that he would finally be able to talk to Ryan, which to us was very welcoming and loving. However Ryan was very wary about meeting Peter the first time, he was very aware that he didn’t want to hurt either his mum or his dad, but he was also very curious to see what Peter was like. When Alethea was 10 months old we met Peter and his family for the first time, and we loved them. I am not going to justify anything that anyone did or didn’t do or go into the past because that is not our story, our story is the here and now. I can only tell you the story from our point of view, so that is how you will hear it. Meeting Peter for the first time was like looking into an older mirror to what Ryan would look like in 30 years’ time, never have I seen 2 people related look so much alike, they were the same height (which is very tall around 6ft 3) they have the same dimples, similar hair, same facial structure and even though they hadn’t spent any time together they had/have very similar mannerisms, they both tilt their head on a certain angle when they are trying to make a point, they both have a very calming voice (which can be raised into a booming voice when needed) the similarities are endless. Peter’s wife Lenore is also beautiful, she welcomed us into her family straight away, she has 3 other children around our age and her and Peter had one daughter Virginia together who was 14 years old and also towered over me in height. Virginia and Ryan also looked very, very much alike. Lenore had known about Ryan since the time her and Peter had first gotten together, and Virginia had been told all her life that she had an older brother, so it was only time before her inquisitive mind would seek us out. We don’t see Peter and the family too much as they live up near QLD but we do talk to them lots and when we do see them, we are told by all the siblings and Peter and Lenore that we are family, and we really do feel like part of the family, and it is lovely, Ryan and I and Alethea love them all, no they do not replace or try to fill in any gaps that we lacked, they just add to our family, which is lovely. Anyway 3 years on Virginia is 17 and absolutely beautiful, and Ryan and I and Alethea love spending time with our ‘new’ family. So back to my story….I was in a very bad frame of mind, I knew things were getting on top of me and I needed to get away. I called Lenore and asked if we could come up and spend some time with them, and of course she said yes straight away, I had also hoped to catch up with a couple of my friends while we were up there. We arrived and were greeted with open arms, it was the first time that they had seen us since Liam had died (they had come to Sydney when I was 36 weeks pregnant with Liam, and although we had invited them to Liam’s funeral, which they all wanted to come to, they had decided that it would be easier on us if they were not there so as not to cause any tension when we were in a very vulnerable state). An hour or so after we arrived Lenore’s daughter Brooke came to see us. Brooke has 2 children Tyla who is 2.5years and Savanna who was born 4 weeks after Liam was. I knew that I would be seeing Brooke while we were there and I was very nervous to how I would react to her baby, I really didn’t know what I would feel. When Brooke walked through the door (she is a bubbly, beautiful mum) I could tell that she too was anxious and basically burst through the door and asked if I wanted to hold Savanna and before I knew what was going on I had a baby in my arms. For many, many girls this would not be the right thing to do, but for me it was just what I needed. I had tears in my eyes looking at her beautiful plump lips, feeling her soft skin and the rise and fall of her chest, but I realised that this was not my baby, it was not Brooke’s fault that she had a healthy baby and I did not, it was not Savanna’s fault that she was here and Liam was not and I fell in love with a little baby girl, always looking with envy at what I had missed out on, but always looking with love. Many mum’s who have lost a baby will not want to touch any baby, look at any baby or see pregnant ladies, the pain is too much for them, but for me I loved to hold and rock this baby, she was beautiful, perhaps it helped that she was a girl and not a boy, I’m not sure, but before I held Savanna I had a huge fear of babies which just dissipated the moment I held and rocked her. Being away from Sydney was lovely; it took my mind off everything that had been consuming my thoughts. We went to Sea World, (and met Dora the Explorer) and we relaxed and had lots of fun, we ate lots, drank lots and I felt normal. I was lucky enough to catch up with my friend Tina, who had been in my mother’s group. Her daughter Evie and Alethea played so well together in a little play land while Tina and I had long chats about life, kids and of course Liam, she cried with me as I told her what had happened and I drank WAY too much (no not a normal thing for me to do!) Tina dropped Alethea and I home that night, and I was not well at all (totally self inflicted!). For me something changed in me being away. Yes I was still angry, but the raging fire that I had before we went had been dampened down, and I was again able to function normally, I was again able to be a mummy, and a wife and see the beauty in the world that had somehow got lost around father’s day when I watched along helplessly seeing my husband, the man of my dreams crumbled before Liam’s grave. Firstly my heart goes out to you Ryan and Alethea for your terrible loss. I have been reading your story since my friend Bron 1st shared it on FB and she again shared it yesterday so I spent 3 hours (early) this morning reading your story and shedding a river of tears. You are a brave and strong women who is blessed to have a loving husband and family. You have every right to demand answers and I commend you on seeking the people you have to investigate this, your anger is understandable and justified because with today’s medicine and living in a city as big as Sydney you should be able to feel confident enough to safely deliver your baby and to trust the hospital and their staff. I had traumatic birth with my 3 y.o daughter with thankfully a very different outcome for which I am thankful every day. I had a placenta abruption which required a blood transfusion and put a 3.5kg 39.3 week into special care for 3 days (she looked incredibly big and out of place in the humidity crib. I guess I was fortunate that I was in the hospital at the time and it was 8.45am when my waters broke and I started to bleed out. Our daughter was born at 9.19am in what I guess would have been a Cat 1 C Section, the only reason for the delay was the anesthetist thought he would give me an epidural so my husband could be present to which my OB when he rushed in (my abruption occurred whilst he was on transit to the hospital) there was no time and order a general and only giving my husband and I enough time to say good bye, this was a very frightening time for us. I can out of the anesthetic some hours later but have no real recollection until about midday only to be told that our daughter had almost drowned in my blood and they were working on her. I share this with you for 2 reasons and what I want to say to you is I am in no way comparing my story with yours, there is no comparison. In every situation particularly bad ones I always try to find some kind of positive and in your case I think the positive is your epidural, which enabled you to have those precious precious minutes with Liam. Secondly that I agree that the care you received was not acceptable and I don’t believe it should go unresolved or actioned. I am not particularly good with FB but my mission to day is to share your post on FB I will learn how it’s the least I can do. I believe your story can help many others. Your blogs is beautifully written and you should consider publishing them, so it can form part of that library for other grieving families. I know when I like you had 2 miscarriages before our daughter it helped me to read others stories and to know that I wasn’t alone with my feelings. Love to you and your family and most of God’s blessing although you probably can’t feel it right now know he is carrying you, Ryan and Alethea with Liam in his care until you meet again. Say goodbye, let um fly, my angel…my best friend. I think our epidural was both very good and very bad. If we had been given a general straight away there is a very good possibility that Liam would still be here and perfectly healthy today, however as many,many other things did not happen the way they should have with his birth I think you could be right, if I was under a general, Ryan would have been left with very different choices to make by himself, I may have missed Liam altogether, and our whole existence today would be very, very different, that would have put a huge strain on our marriage, and I would never have wanted him to go through that alone. Thanks for sharing that beautiful song, its one that I don’t recall having heard before. Oh gosh my heart does ache for you. I have followed all your posts and admire both your strength and brutal honestly. And I too would be doing exactly what you would, ringing all hospitals etc. my son was not born in time and he has severe learning disabilities. I have severe guilt that things did not go as they were planned and even though I was begging them to get Alex out they did not. I now have a child who has over 30 seizures each day, has autism because of the brain damage and ADHD. I live in new Zealand and there is no government support for therapy for Alex which costs literally 900$$ nz each week (ABA therapy for his autism). I am not sure why I am telling you this and of course I am glad I have Alex but the truth is protocols and procedures need to change. As a mother I was not listened too….I was vulnerable and helpless during his delivery. Alex was close to 10lbs and the student midwife misplaced my catheter during the epidural which meant I was trying to push out a huge baby with a bladder close to bursting but could not feel it due to the epidural. My now ex partner is consumed with guilt and is now a drug addict. Life could not be worse for me rIght now. I love my baby boy (now five) to bits but my heart is heavy with guilt. Policies need to change. I hope that you can channel your anger into doing something to change this. Much love and support xxxx Katie. Please email me if you wish xox Katie.hooton@gmail.com. I promise to listen and to be there for you. I have read your whole blog tonight, I have cried and cried and am now feeling really angry for you having gotten to this part. I am going through a legal case of similar here in the UK, only it took 4 hours from the decision and realisation that our boy was in a bad way. I had presented with lack of movements and it was noted 4 hrs before delivery that the ctg = chronic hypoxia. It is unjustifiable and so sad to hear that babies are suffering not only here in the uk and there does seem to be an epidemic of it at the moment but that it is also happening the other side of the world in another ‘civilised’ country. Our little boy was not delivered and I was not rushed to theatre till they had watched his HB get lower and lower and till it finally stopped. This was during day time hours, there was just no excuse. I am so thankful I was knocked out cold. Our boy went without a heartbeat for 31 minutes in total. The one thing I have learnt in our journey (Jules will be 3 in March) is that there is no rhyme or reason to the outcome of these sweet precious babies. What is one babies story and journey, has a totally different ending for another one. I think you have been so very controlled in your letters, they are all very well constructed and do not show nastiness as you worry about, they show a mum who wants and deserves answers. What makes me angry is, if the consultant is found to be at fault in our case the hospital will pay and he will carry on working. That makes me so angry….I used to work on check in for an international airline and later as a travel agent and if I had sent someones bags somewhere wrong or booked someone to the wrong country on holiday I would most likely have lost my job yet those mistakes are not life threatening, yet these doctors get away with it…that I do not understand. i have so much anger. I sit here and google the consultant hoping to find he has been up for negligence before or after but then glad that I don’t find it as it means another family has not suffered. I stop myself from getting in my car and going and beating him and bashing his head on the floor till he has the same amount of brain damage that our boy has, till his eye sight is poor and his eyes are wonky, till he has to wear hearing aids to hear, till his legs do not work from cerebral palsy, till loud sounds and different textures scare him due to sensory disorders…but if I did that I would go to prison…yet he has done it through arrogance and yet he won’t go to prison. Oh Helen, what a terrible time you and your family have been through, I am so sorry that the medical profession/hospital etc let you and your little boy down. I came to the conclusion the other day that society as a whole does not value the life of an unborn child (I’m not talking about abortion etc that is a whole different story, I’m talking about a proper baby that is ready for this world). If the child has not yet taken its first breath the medical profession seems to be able to wave their hand in the air as if it doesn’t matter, they are not yet classed as living, yet these professionals lack of action lead to drastic consequences…our little boy died, your little boy is severely disabled, how can they be OK with that?!! I just shake my head at that fact, I also know that while I am left picking up the pieces of my families life they are able to go home to their happy families, enjoy a glass of wine and believe that the world is a good place and that they help society by being the people that they are….. The standard of care, the availability of staff, the opening our of the operating theatre, all these things in Australia are substandard, if having all these things on hand in all hospitals all the time only saved 1 baby’s life or prevented 1 baby each year from having a disability then it would be worth it, maybe not monetary wise for the government but certainly for the family who it affects. I’ve cried for you whilst reading your blog, it’s absolutely heartbreaking. I’m just wondering if you have requested that the Coroner investigates Liam’s death. The Coroner looks into all aspects of the medical care and systems within the hospitals where they failed and then can make recommendations to change the systems and in some cases take action against those responsible. Thanks for your message….I thought about the Coroner around Christmas time, one would think that given the circumstances surrounding Liam’s death that the hospital themselves would have had a duty to report his death to the coroner….however I’m pretty sure they thought their first explanation to me that his death was just terrible, terrible luck and that this kind of thing only happens every 2 years or so was going to be enough to satisfy me….they have no idea!! I’m proud that my little boy may have helped save another baby. Most of the time a baby’s birth happens without any problems, however when problems do occur they are very, very serious, and often require immediate action, lack of 24hr theatres is an ongoing issue for lots of hospitals, I’m sure the government and private sector believe that it is not cost effective to staff it 24/7 due to the low numbers of absolute emergencies that occur……but for me, I believe if every hospital staffed 24hr theatres and just 1 baby’s life was saved a year then it is worth it….not to mention helping prevent lots of baby’s who are born with disabilities because of a delay in their birth.